I’m a fan of board games and have been since I was a kid. I particularly like special editions of board games that bring a new dimension to the traditional game. 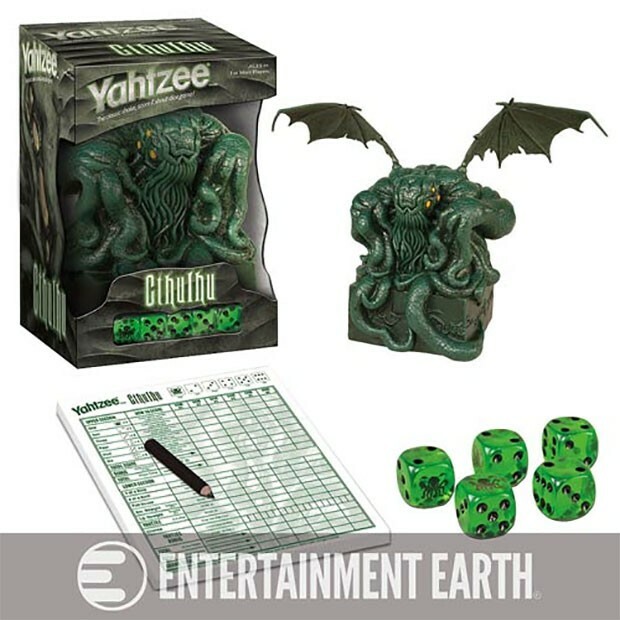 This Cthulhu version of Yahtzee is a perfect example. Rather than a plain red cup for your dice, you get a Cthulhu statue wearing wings that are clearly too small to get the creepy monster aloft. The dice that go inside the fancy cup are also special. They are a clear green with normal dots and a Cthulhu silhouette to represent the one. The Great Old One, that is. You can pre-order yours now at Entertainment Earth for $29.99(USD), with the game shipping starting in December 2015.